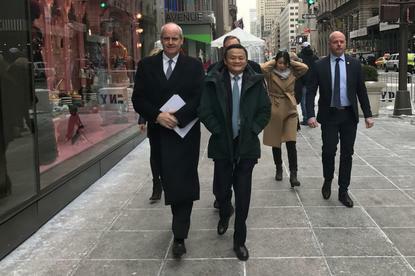 Jack Ma met Trump in New York and the two talked U.S.-China trade and specifically small business. Ma promoted Alibaba as a platform through which U.S. small businesses could sell products to consumers in China and Southeast Asia. By doing that, up to a million new jobs could be created at a million small businesses, Alibaba said. Alibaba didn't commit to hiring new staff in the U.S. itself. "We mainly talked about small business, and young people and selling American agricultural products to China," said Ma. He said he envisaged most of the jobs being created in the U.S. Midwest agricultural sector, and also mentioned garments, fruits, and wines as possible goods that could be successfully sold to Chinese consumers. "Jack and I are going to do some great things," Trump said to reporters after the meeting without commenting further. Alibaba operates a hugely successful e-commerce site in China and has been expanding overseas to compete directly with Amazon through AliExpress. But it hasn't all been smooth sailing for the company. At the end of 2016, its Taobao marketplace, a consumer-to-consumer site much like eBay, was placed on the U.S. Trade Representative's list of "notorious markets." These are online and offline market places that enable "substantial copyright piracy and trademark counterfeiting." Taobao had been on the list previously but was taken off four years ago. Its return prompted the company to question whether the decision was based on the election of Trump and what was viewed as his anti-China trade stance. In recent weeks, Alibaba has announced a crackdown on counterfeit goods on its online marketplaces, including filing lawsuits against Taobao sellers.